Mr. Coffee started in 1972 with the automatic drip coffeemaker that revolutionized coffee. Mr Coffee has other products like the Potato Perfect, Mrs Tea Hot Tea Maker or the Mr. Coffee Juicer etc. However, it is their coffee machines that Mr Coffee is famous for. Comes with a removable milk reservoir, one-touch control panel & automatic milk frother for a variety of coffee brews. Also comes with an adjustable cup tray & a removable drip catcher. Customer satisfaction ratings are high up. Mr. Coffee Cafe Barista Espresso Maker with Automatic Milk Frother is a pump-pressured espresso maker without needing the skills of a barista. The unit delivers a good cup of espresso shot without much hassle. The only thing you need to do is to dose and tamp your coffee grounds. The button will do the rest like brewing espresso, steam and frothing milk. The control gives you the power to adjust the coffee strength with the automatic or manual function. Mr. Coffee Cafe Barista Espresso Maker has an appealing design with a stainless steel front and sleek buttons to give an elegant feel to it. The user manual comes with detailed instructions on how to get the best out of the unit and 20 recipes to create an impressive beverage for your enjoyment. Comes with automatic milk frother that steam and froth with a push of a button, leaving you free to do other things. Milk reservoir is removable which means you can remove the tank and store it in the fridge without wastage. There is no hot water but a house a large removable water reservoir that hold up to 55 ounces of water allowing you to brew multiple drinks at one shot. With the price, Mr. Coffee Cafe Barista Espresso Maker does not short-change you on the pressure. The 15 bar pump pressure feature makes this unit deliver powerful espresso. User-friendly controls brews espresso, cappuccino or latte in a few minutes with a touch of a button. Stainless steel and durable plastic to last a long time. This unit measures at 14 x 12 x 12.2 inches (D x W x H) and weighs 9 pounds. It comes with a 1 year warranty by Mr. Coffee. There are indicator lights located at the top right side of the unit and a knob to adjusting the level of frothing. A removable drip tray to make cleaning a breeze and an adjustable cup tray to handle various sizes of cups and mugs. Come with a plastic measuring scoop/tamper, two filers for single and double shot. There is an auto-cleaning function after each steaming cycle while the removable water and milk reservoir makes Mr. Coffee Cafe Barista Espresso Maker easy to clean. All the parts except the portafilter are dishwasher safe. 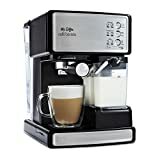 The price of the Mr. Coffee Cafe Barista Espresso Maker with Automatic Milk Frother cost around $230 on Amazon with free shipping within US. 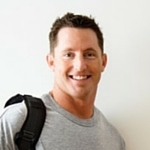 On Amazon, Tim wrote, “Great Espresso Machine for a great value!”. Tim says Mr. Coffee Cafe Barista is great for a busy family as it takes just a few buttons to have delicious espresso. Cleaning up is easy and the milk container easily separates from the machine. Tim also loves the recipe book that came with the machine. Erin claims the machine is fantastic and the froth is amazing. A plus point is she can customize each drink and the price is great compared to other similar models. Make new and delicious gourmet coffee beverages quickly. 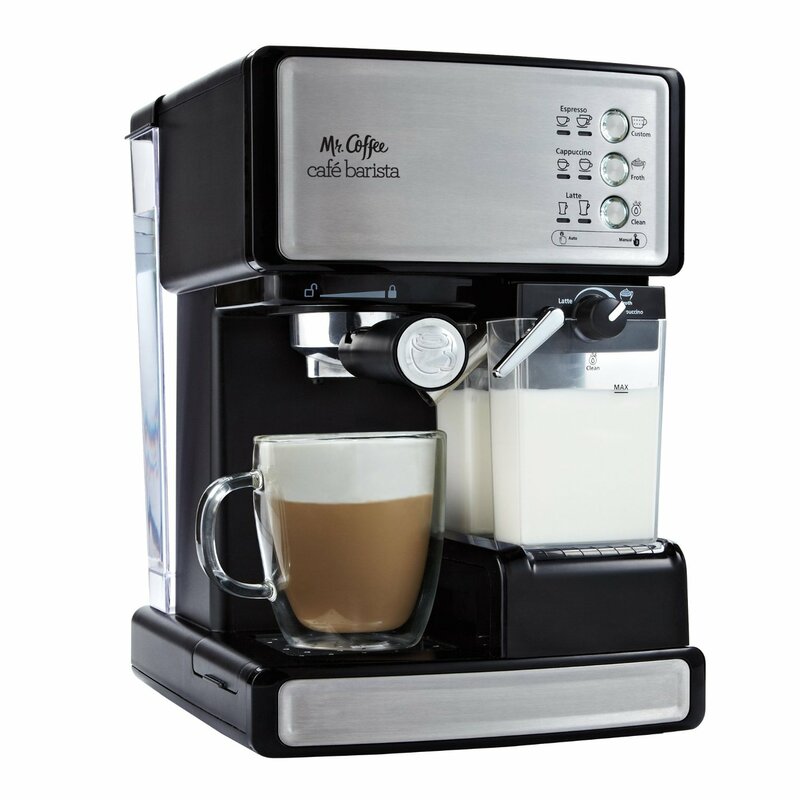 Mr. Coffee Cafe Barista Espresso Maker with Automatic Milk Frother delivers fuss-free performance while offering convenience if you need to make delicious beverages without much hassle. It is a self-contained unit that does not take up much space making Mr Coffee Cafe Barista Espresso Maker a great machine for your kitchen. You can now be your own barista at the comfort of your home!